Wizards of the Coast have announced the signing of a new contract with R.A. Salvatore, their most successful author. Salvatore will pen six new books set in the Forgotten Realms setting featuring his signature character, the dark elf Drizzt Do'Urden, to be published between 2011 and 2016, almost taking him up to the thirtieth anniversary of the publication of his first novel, The Crystal Shard. The article is noteworthy for mentioning Salvatore's popularity. I'd seen previous claims that Salvatore had sold 10 million books worldwide, which struck me as possibly on the low side compared to Weis & Hickman's 22 million given that Salvatore has, unlike them, had a constant rate of output since the late 1980s and also has a greater profile currently. The article confirms this, stating that Salvatore's sales now stand at 15 million in the United States alone (meaning far higher, maybe twice that much, worldwide). This definitely puts Salvatore in the big league of fantasy mega-sellers, on a par with or just ahead of the likes of Terry Goodkind, Terry Brooks and Raymond Feist. 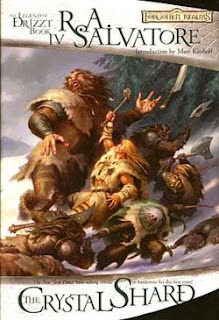 By all accounts Salvatore is a great guy who has been a major inspiration to a generation of budding fantasy writers and his early books (the first nine or so) stand as fine examples of 'gateway' fantasy books for younger readers looking to break into the genre. I absolutely love Drizzt Do'Urden series of books. But there are things that went a bit too far with this character and although I would buy and read all of the books written by R.A. Salvatore, I am afraid that maybe this deal will not push Drizzt's novels beyond an acceptable boundary and to be make only for the sake of sales. I hope not, but come to think of it we after all live in a material world. Oh dear merciful gods in heaven. SIX MORE DRIZZT BOOKS? Is this not putting Salvatore in danger of assassination? When there were three books - fine, pretty ordinary gateway fantasy. When there were six books - well, they're a bit weird, but they're innovative, and may actually be be better-written than the first three. When there were eight books - OK, this isn't going well, it's getting really repetitive. When there were ten books - OK, that's it, he's just reprinting the old ones with some names changed why the hell is he still allowed to carry on like this? Then... there were seventeen books. How did that happen? Is somebody still reading these? WHAT? There's twenty of them!? And the twentieth has seven liches, and a dracolich, and an undead illithid??? And now.... TWENTY-SIX DRIZZT BOOKS? I mean, I know that the original trilogy was a little above average for TSR, but still, did it really deserve TWENTY-THREE SEQUELS??????? That said, I'm impressed by Salvatore's patience, even if it is bolstered by vast wads of cash. I'm reminded of a cricketer remarking on Lara's first class innings record: "I could never score 500 runs. I'd get bored and fall over." The man must have immense stamina to keep writing sequels with the same five or six characters for thirty years. I seriously enjoyed the Dark Elf trilogy, was a little disappointed but still liked the Icewind Dale trilogy and then was rather ho-hum with the next 4 books after that. Have not read a Drizzt book since and not sure if I ever intend to. Either way, they're nice enough novels and he's a good enough writer that I can only say congratulations. That being said, I attempted "The Woods Out Back" and gave up half way through as I found it an appalling piece of utter tripe. "And the twentieth has seven liches, and a dracolich, and an undead illithid???" Drizzt is my favorite character and I consider him a friend and companion. i don't care what anyone says there will never be enough of his story told. so until the day when either he or I fall, Drizzt will always have my sword arm. i look forward to many more adventures, "old friend." Phew! I need another one after the ghost king! i read part V of the cleric quintent as my first foray into salvatore and while it held my attention and i finished it, i knidah felt like he had a lot of filler in there and was stretching things out. granted, the guy churns out a book every 3 or 4 months, so he has to figure out a way to fill 30 pages, so i get it. Great post. I actually stumble across via Twitter, but nevertheless, I just cracked into the first of the Neverwinter trilogy (finally) and am lovin' it!